Youth in arts submitted over 80 pieces of art to the Kennedy Center’s VSA Arts international on-line show, which had nearly 500 entries from around the country. Only one piece (Shaylynn’s artwork) was chosen to be one of the 16 framed, and exhibited in the US Department of Education this Spring! (Shaylynn was a student in Marci Ryan’s special day classroom at Lynwood School last year). Julia James uses large mirrors to help students with autism look carefully at their own faces, practice making faces of various emotions, then guides the students through a process of creating a symmetrical portrait of themselves. Shaylin created a self portrait in oil pastel and watercolors. She created cartoon images of creatures showing a variety of emotions around the border. 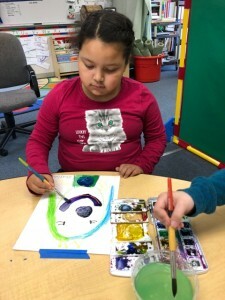 Painting and drawing offer students of all abilities a safe way to explore all of their emotions, and also offers them a safe form of risk-taking with materials, techniques and textures. 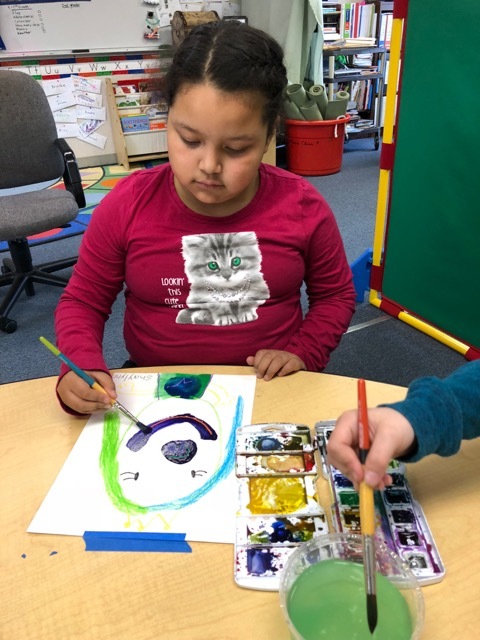 Youth in Arts is the only arts organization providing arts opportunities to children with special needs in Marin County: nearly 300 students every year!